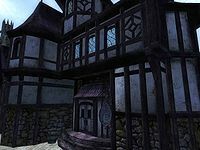 The Cheydinhal Bridge Inn is one of the two taverns located in Cheydinhal's Market District. Despite its name, the inn is located nowhere near either of the two bridges in Cheydinhal; it is found just inside the West Gate, across the street from Newlands Lodge and next to Mach-Na's Books. The publican, Mariana Ancharia, will buy potions and food while selling only the latter. The ground floor contains the reception area, which consists of a bar and counter, a dining room, and a huge barrel supposedly used to produce wine. Upstairs are two rooms: a small sitting room containing a miscellaneous display and the room you rent. It is spacious and well-lit and contains an upper-class double bed, a writing desk, a shelf for items and a table. If you're willing to pick the lock, the inn's basement has four unowned double beds, divided between two rooms. Shelley sleeps in one of them, but there is nothing stopping you from sleeping with her. Entering the basement does not count as trespassing; therefore it's possible to use the beds. Esta página foi modificada pela última vez à(s) 22h01min de 25 de agosto de 2013.